At this month's Los Angeles Auto Show, the German performance automaker will unveil its green plan for a new century - the last one. Next to its new Porsche Cayenne Hybrid SUV at the 2007 Los Angles Auto Show later this month, Porsche will show off an electric car from 1900 designed by founder Ferdinand Porsche. This is the predecessor of what Porsche Cars claims was the world's first hybrid car, which followed this one by just a few years. Even Porsche's initial all-electric design was revolutionary, despite the fact that electric cars were fairly common (insofar as any automobile was common) at the turn of the last century. 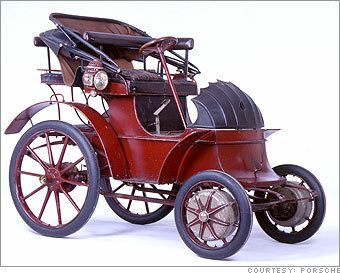 Porsche's electric car was named "most innovative invention" at the Paris World's fair in 1900, notoriety that resulted in the sale of over 300 of the cars.